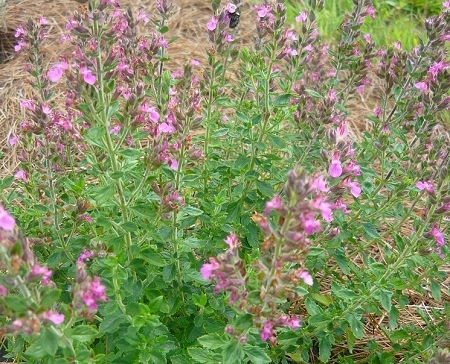 Germander (teucrium chamaedrys) Low-growing shrubby plant features attractive dark green glossy leaves and rose pink flowers mid-summer through fall. Flowers attract bees and other beneficial insects to the garden. A favorite plant for knot gardens and edgings, germander can easily be pruned to form an attractive tight hedge. Aromatic foliage and flowers are often dried for use in herbal wreaths and other crafts. Slow growing shrub, evergreen. Full sun to partial shade, likes well drained soil. Perennial zones 5-11. Live plant in 3 inch container.